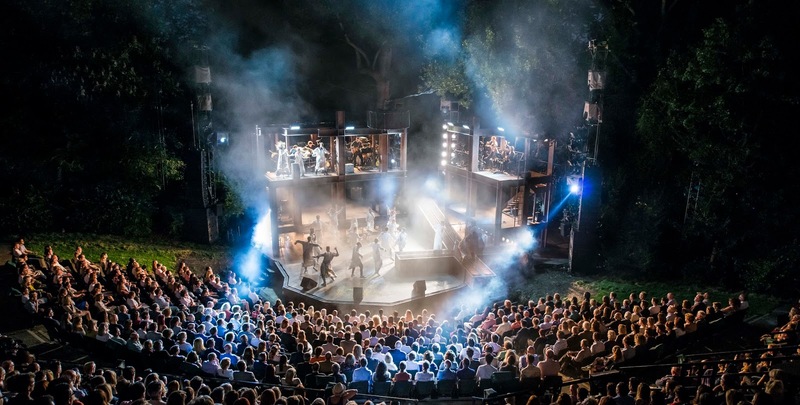 Regent’s Park Open Air Theatre has today announced completed casting for Tim Rice and Andrew Lloyd Webber’s Jesus Christ Superstar, which returns to the theatre from 11 August in an extended run through to 23 September 2017. Already announced are Declan Bennett, Tyrone Huntley (who won the Evening Standard Emerging Talent Award for his performance in 2016), David Thaxton and Peter Caulfield, who reprise their roles of Jesus, Judas, Pilate and Herod. The 2016 production won the Olivier Award for Best Musical Revival and Evening Standard Award for Best Musical. Maimuna Memon takes the role of Mary. Previous credits include Winnie and Wilbur(Birmingham Rep), Lazarus (King’s Cross Theatre), The Busker’s Opera (Park Theatre) and Into The Woods (Royal Exchange Manchester). Phillip Browne and Sean Kingsley play Caiaphas and Annas. Phillip’s previous credits include Ain’t Misbehaving (Sheffield Crucible), Anything Goes (Theatre Royal Drury Lane), Piaf (Donmar) and Ragtime (Piccadilly), and he also appeared in the 2012 film Batman, The Dark Knight Rises. Sean, who recently appeared in The Grinning Man (Bristol Old Vic), reprises his 2016 performance as Annas. His previous credits include Jersey Boys (UK Tour), We Will Rock You (European Tour), Little Shop of Horrors (Birmingham Rep) and Mamma Mia! (International Tour). Tim Newman and Phil King play Simon Zealotes and Peter. Tim’s credits include Memphis(Shaftesbury), Mamma Mia! (International Tour), Grease (Piccadilly), Footloose (Novello) andAll The Fun of the Fair (Garrick/UK Tour) for which he received a WhatsOnStage Award nomination. Phil, who reprises his performance as Peter, composed the music for, and appeared in, To Kill a Mockingbird at Regent’s Park Open Air Theatre. His previous credits also include Jane Eyre (Bristol Old Vic/National) and, as a musician, he plays festivals and fayres across the UK, as well as Paris, Berlin, Barcelona and New York. With direction by Timothy Sheader, design by Tom Scutt, choreography by Drew McOnie, musical supervision by Tom Deering, lighting design by Lee Curran and sound design by Nick Lidster for Autograph, Jesus Christ Superstar was a sell-out in 2016 and, in addition the Olivier and Evening Standard Award-wins, also received a further five Olivier Award nominations, for Best Theatre Choreography, Best Lighting, Best Sound, Outstanding Achievement in Music, and Best Actor in a Musical (for Tyrone Huntley). The production opens at the Lyric Opera of Chicago in April 2018. The 2017 Open Air Theatre season also includes On The Town, (until 1 July) directed and choreographed by Drew McOnie. This is followed by Dickens Uncovered celebrating the greatest storyteller of London life, Charles Dickens. Artistic Director Timothy Sheader directs A Tale of Two Cities (7 July – 5 August), a new play by Matthew Dunster adapted from the original Dickens novel and, developing their programme of work made especially for families,Caroline Byrne directs a new play version of Oliver Twist created for everyone aged six and over adapted by Anya Reiss (17 July – 5 August). Regent’s Park Open Air Theatre was voted London Theatre of the Year in the Stage Awards 2017, and recently announced a collaboration with English National Opera for their 2018 season, with Timothy Sheader directing Benjamin Britten’s The Turn of the Screw (22 – 30 Jun 2018).